Fixed biomass treatment processes (biological filters, biorotors or biodiscs, etc.) use a media so as to put a maximum amount of purifying bacteria in contact with the pollution to be treated. Pamco biorotors are different from biological filters because the media that is in contact with the biomass is not static: it is fixed to a shaft that is slowly rotating using a gear motor. The pamco biorotor is fitted inside a tank through which the effluent to be purified passes through. Sometimes submerged, sometimes out of the water due to the rotating shaft, the purifying bacteria are put alternatively in contact with the pollution to be treated and with the oxygen in the air. A fairly dense (around 4% solids) bacterial biofilm develops on the surface of the media. Colonisation of pamco biorotors only takes a few days. The surface of the media to be used depends on the pollution to be treated and the performances to be reached. The pamco biorotor rotates to mix the water, to transfer oxygen and to prevent short-circuits. The rotation speed is low and depends on the diameter of the biorotor. It has to be adjusted depending on the hydraulic or pollutant load: higher rotation speeds guarantee a good mix in the tank in the event of a high hydraulic load. However, when there is a high pollutant load, the rotation should be slowed down in order to improve the transfer of the pollutant to the biofilm. Even with a high detergent concentration and “high” rotation speeds, the device never foams up. Of course, the production of biological sludge depends on the pollutant load. This sludge sediments very quickly because it is mainly very well mineralised strips of biofilm that come off the media. Clarification of the effluent is usually very good for climbing speeds of around 1 metre per hour. Recycling the water is usually not necessary. Recirculation can be useful, during long periods when there is no flow of wastewater, so as to discharge flecks of biomass that tend to become detached into the settling tank. An essential quality of a biodisc installation is to be the most simple, the most ‘hardy’ as possible. 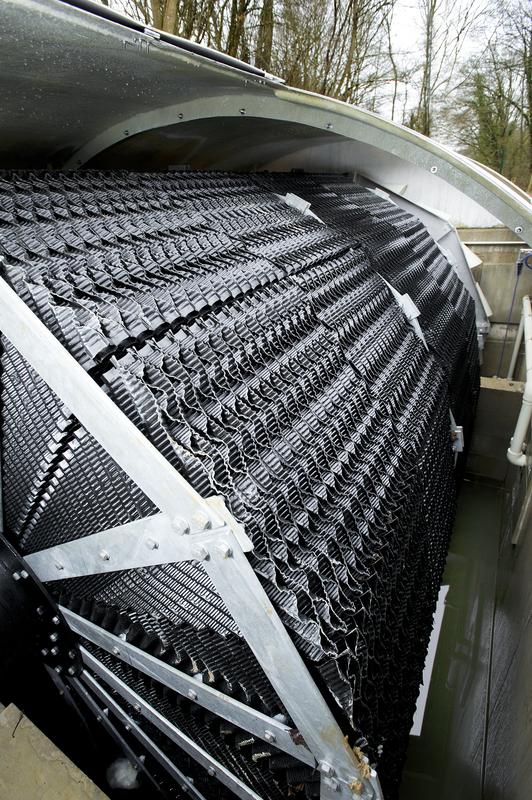 a static clarifier-settling tank for small plants, or a scraper settling tank for larger ones, with draining of the biological sludge into the sludge decantation and digestion tank.